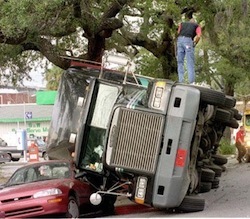 Burbank Truck Accident Injury Attorney - Over 40 Years of Experience You Can Trust! Were You or a Loved One Hurt in a Truck Accident or Car Accident in Burbank? Our Burbank truck accident injury lawyers and law office provide excellent personal injury legal services for anyone injured in truck collisions, as well as for the families and relatives of those killed in truck and other deadly accidents for wrongful death claims, including accidents involving big rigs or 18 wheelers, in Burbank, a city located in Los Angeles County, California. If you or anyone you know was involved in a truck accident or other personal injury claim in Burbank, Glendale, Los Angeles or anywhere else in California, please contact our truck accident injury lawyers and law firm now for a completely FREE CONSULTATION. To learn more helpful facts about truck collision injury claims and our law firm, please visit our Truck Injury Accident Web Site. Burbank is surrounded by Los Angeles to the south, Glendale to the southeast and the community of North Hollywood to the west. Burbank is known as the "Media Capital of the World" for being home to numerous media and entertainment companies such as Warner Bros. Entertainment, Cartoon Network Studios, Nicktoons Studios, Warner Music Group and The Walt Disney Company. The Bob Hope Airport is also located in Burbank and is undergoing an expansion with future projects to increase its size. One of Burbank's most famous restaurants to dine at is Bob's Big Boy, and its Burbank location is the oldest remaining from the restaurant chain, making it a great place to visit and eat a delicious burger within an old fashioned diner setting. According to the 2010 U.S. Census, Burbank has a population of 103,340. If you or a loved one have been involved in a truck accident or other personal injury claim in Burbank, Glendale, Los Angeles or anywhere else in California, please contact our truck accident injury lawyers and law firm now for a FREE CONSULTATION. Truck accident victims can be inflicted with injuries ranging from minor to life threatening. One serious injury is a shoulder blade fracture or scapular fracture. High speed vehicle accidents are the most common cause of a shoulder blade fracture. Signs of a shoulder blade fracture include pain around the area with swelling and tenderness. Treatment consists of immobilizing the affected area and later having physical therapy. If you or anyone you know sustained a shoulder blade fracture from any truck collision or other personal injury accident, please contact us now, including for referrals to doctors who may provide treatment without requesting payment until the claim is resolved, in Burbank, Glendale or anywhere in California. The Law Offices of Gary K. Walch, A Law Corp., provides you with the strong advocacy that you need when you or someone you love has been through a horrific truck collision or other injury accident in Burbank or anywhere in California, and at the same time, the understanding and compassion to make the process easier for you and your family. It is our task to best represent your interests and aggressively pursue your rights. Our team deals with accidents involving truck, bus, train, car, hit and run, pedestrian, uninsured motorist (UM), bicycle, motorcycle and much more.